Presented at the Palmer House Hilton Hotel in Chicago, Illinois on June 6, 2015. 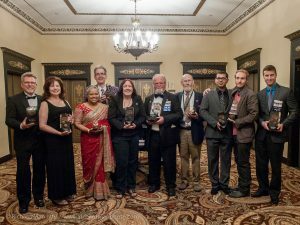 This marked the Fiftieth Anniversary of SFWA. Programming included the second day-long ISBA/SFWA Legal Symposium on Protecting and Preserving Author Rights, and a Self-Publication Workshop as well as a three tracks of heavily pro-oriented panels. Nick Offerman was a controversial Toastmaster, and although many attendees enjoyed his bits, some were not amused. Tours were offered to Argonne National Laboratory and Fermilab. “Worldbuilders of Science Fiction and Fantasy,” a portrait project about the people who create these wonderful worlds, photographed on large format film, started at the 2015 Nebula weekend.